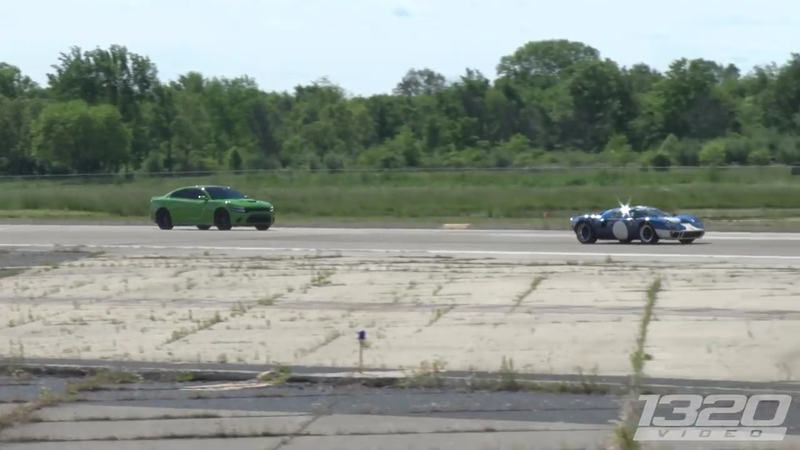 I don’t know about you, but I never tired of “watch X car beat a Dodge Hellcat in a drag race.” It’s even more satisfying when the winner is an “old” car like a Ford GT40, something that was never intended to be a quarter mile competitor. I’ll explain why “old” was in parentheses: the GT40 in this video is not a “real” GT40, because those cars are usually in museums and only come out to play for concours events. This car is a Superformance GT40 replica. However, despite the car’s lack of official pedigree, it is still a fairly accurate representation of the legendary race car that embarrassed Ferrari at LeMans. Unlike the Hellcat, the Superformance GT40 doesn’t have a supercharger or anywhere close to 700 horsepower, but the old racer also doesn’t have around 4,500 pounds of curb weight to lug around. Rather, the GT40 tips the scales at about 2,700 pounds and therefore only needs 450 HP to show some of these youngsters how it’s done. Now that the Demon will be Dodge’s new drag strip warrior, what’s the point of owning a Hellcat if you are just going to get beat by old cars and ones that just run on electricity? Poor Hellcat. I remember when you were cool.